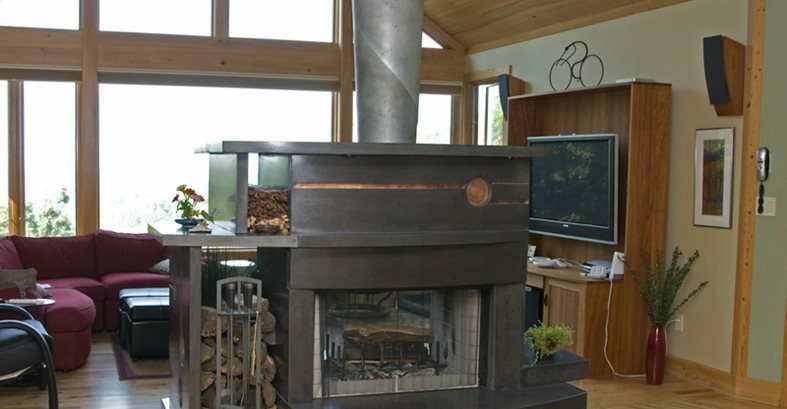 This freestanding fireplace can be viewed from all sides. Front view of fireplace as you walk in the front door. Backside of fireplace from living area. This image depicts the forming of the hearth in three pieces. On the left side is a foam blockout for the electrical compartment. Electrical wiring was routed behind and down the fireplace. 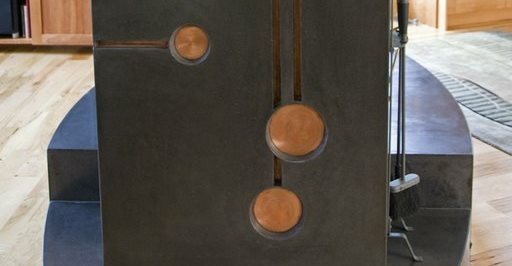 In the finished piece, the firewood holder is sitting on this hidden compartment which is covered by a zinc plate. In this image, the light switch, which controls the mantel lights, is slightly visible in the bottom left corner. This image shows French spray gluing foam for reliefs. This image shows the beveled circular piece, which was spray glued into mold, and holds the copper inlay. 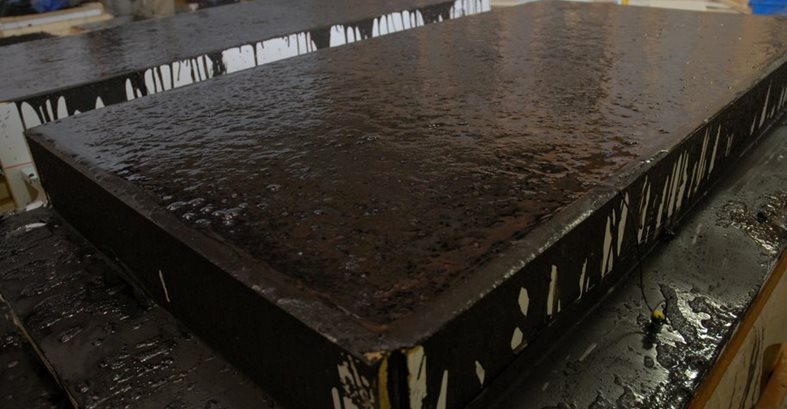 This image shows the copper spray glued into the form. 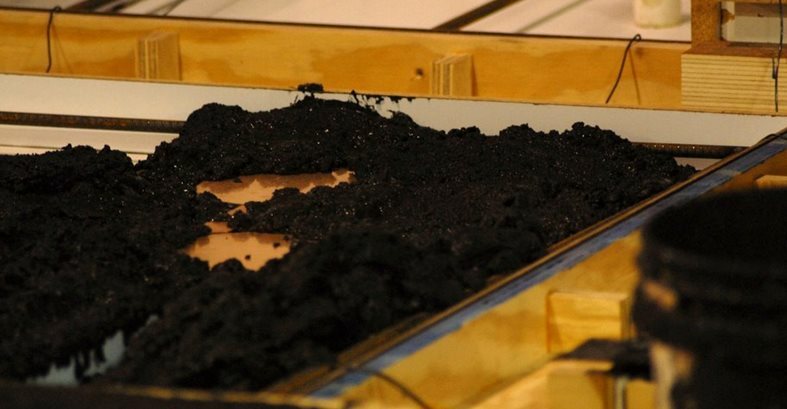 "The copper is 1/8" wider than the foam so concrete wraps around it so it holds the copper in place. Doesn't appear to just be stuck on from the outside like an afterthought," says French. The concrete started out very stiff. Then it was vibrated and turned into liquid. It's one thing to dream up and design an extravagant concrete fireplace, but it's another to be able to build it. 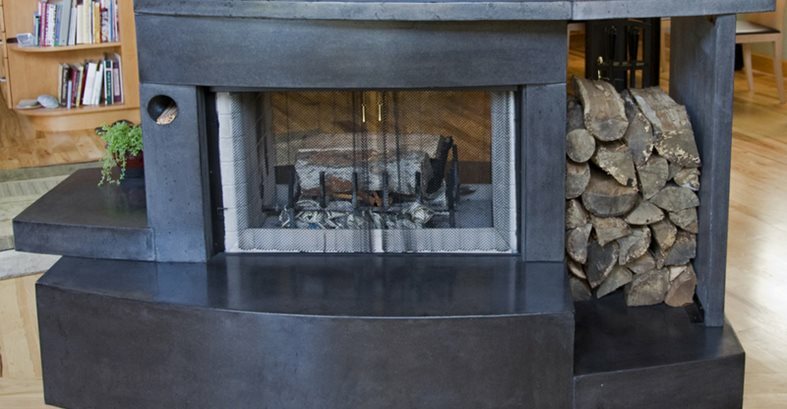 When Alchemy Design Studio approached Jeremy French, owner of Mandala Design Ltd., to fabricate this unique concrete fireplace, he knew there would be some creative thinking involved in terms of building it. One thing French has noticed with designers is that many see and appreciate the qualities of concrete, but they don't know what concrete can and can't do. "Very few designers send us specs," says French. "Instead, they come up with a concept." Skilled as a concrete craftsman, French is able to take that concept and get into the details, examining thicknesses, inlays, etc. "I help get them up to speed on what they can and can't do," he says, and then the design concept really starts to take shape. "If this fireplace had been built with GFRC, it would not have required any steel or reinforcement," explains French," and it would have been far less heavy." Beginning in 2008, Mandala Design, Ltd. started using GFRC. "It was originally only 20-30% of our business," recalls French. 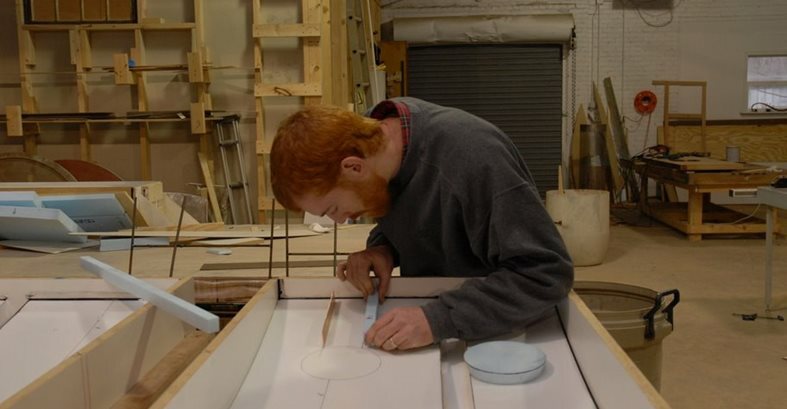 "We used it typically for 3-dimensional pieces, and the rest of our business was countertops." French says he now looks at GFRC as a new tool in his toolbox. "We spent years refining our mix and how our entire shop was laid out based on the traditional wet cast method." GFRC changes all that with its shortened cure times which means less room is needed waiting for wet cast projects to cure. The benefits of GFRC have outweighed the traditional methods. "We now build more out of GFRC," says French. "When a job comes in, we look at job costing and other variables. The thicker, more complicated jobs get GFRC." This particular project involved creating a four-sided fireplace surround that would literally be the center focal point in a home in Asheville, NC. "The fireplace is viewable from all sides," says French. "When you walk into the house, it's front and center." French says it was critical to build a scaled mock up. 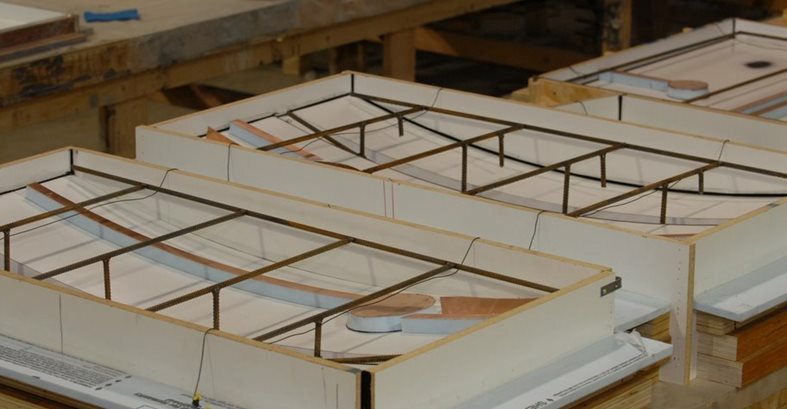 "We used 2 inch foam to build a mock up and this helped us see any problem areas, and where we should modify it to make it look better overall." French stresses the importance of building a to-scale mock up. "I have always changed a mock up in some way," he explains. "We change an angle or a line here or there. It really puts a project where it needs to be." Built in 14 pieces, this fireplace demanded astute attention to detail. There are a variety of unique nooks and creative functional features. 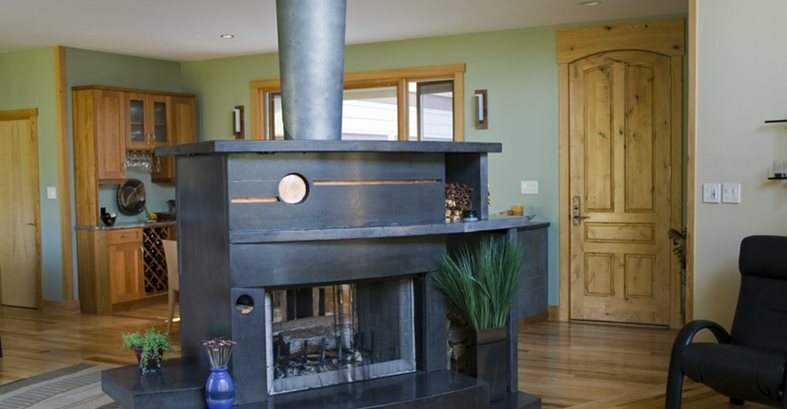 The fireplace includes a shelf with kindling, a match holder in the left corner, lights under the mantel, hidden electrical compartment with a zinc plate covering the access point, copper inlays, firewood holder, and hearth seating. The clients chose one of French's standard slate gray colors. The fireplace dimensions were as follows: The header above the fireplace is 2 feet. The thick part of the hearth is 18 inches. The entire surround measures 7 1/2 feet across including the cantilevered seat of 18 inches.